The Transformer of Strollers: this one piece is both a car seat and stroller. Kia (and Clara!) show you more. You’re used to having car seats clip into strollers, but how about having JUST ONE piece of gear that transforms from car seat to stroller?! 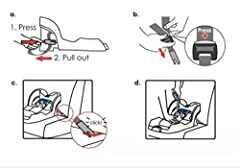 Just fold back the wheels, retract the handle, and slot it into the car seat base (or buckle it with a seat belt). And presto! Nothing extra to lug around, nothing extra at all. That’s kind of amazing: the Doona is the only product of its kind. It’s not just two-in-one, it’s three-in-one: you can also use it as a baby rocker. 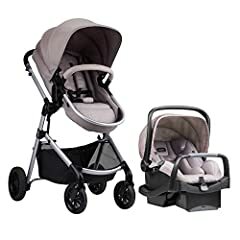 Of course, nothing’s perfect, and the Doona has a couple of downsides: 1) it only holds up to 35 pounds so your child outgrows it faster than many other strollers and 2) It’s probably not full-featured and maneuverable enough to be your everyday walking stroller. It’s also bit on the pricey side. If you’re going to be using it with multiple kids though, that helps to justify the price point! And it truly is the perfect stroller for taking on quick car errands or on the plane. It’s narrow enough you can actually push it down an airplane aisle. And how awesome would it be not to wrestle a stroller in and out of the trunk just to run to the store? 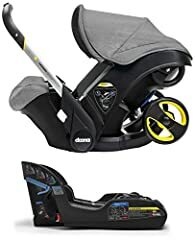 You can transform it from car seat to stroller (and vice versa) without taking your baby out of it. People with chronic lower back pain love that feature; you don’t have to bend over to strap your baby into their seat! 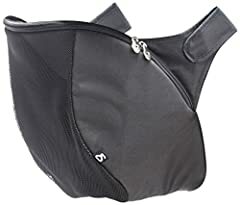 It’s got orthopedic cushioning in it so it’s really comfortable for your baby, and lots of great safety features as well. The canopy looks stylish and there’s no need for a peekaboo window since baby is facing you. It comes in some good colors, too.